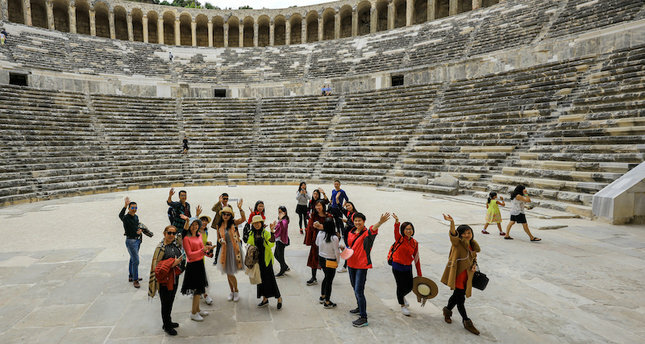 Chinese tourists continue to choose Turkey as a holiday destination not only for recreational purposes, but because they are attracted to its wide variety of historical sites. The most popular Turkish destinations for Chinese tourists tend to be Istanbul, Cappadocia, the Aegean Sea region and the historical sites of Aspendos and Perga in southern Turkey's Antalya province. In 2016, a total of 167,500 Chinese tourists visited Turkey and the country aims to make this figure even higher. The chairman of the Turkish Hoteliers Federation (TÜROFED), Osman Ayık, told Anadolu Agency that the tourism potential from China is huge and that, according to estimations, more than 100 million Chinese people have a high level of purchase power and thus are of interest to Turkey as potential visitors. The TÜROFED chairman said that the Chinese visitors were mainly interested in cultural tourism and preferred sightseeing and educational activities to sea, sand and sun. However, Chinese tourists are also known to shop in Turkey, alongside the cultural tours. Ayık's aim is to attract more than a million Chinese tourists per year. He stressed that 2018 has been declared as "Turkey tourism year" in China and that this opportunity should be put to good use. Ayık has proposed to develop tourist packages tailored to Chinese customers, "Special packages can be made which comprise several countries. This can be done in conjunction with the Greek islands, the Balkans, Georgia, Armenia, Iran and Ukraine." Through special agreements with these neighboring countries, the market for Chinese cultural tourism could be further expanded, Ayık added.